You might not have thought so when you were struggling through your Spanish class at school, but as we get older, most of us come to appreciate the wonder that is language. It’s one of the few things that distinguishes us from other animals, and each of the 6,000 languages in the world today embodies the rich history and culture of its speakers. Here are six charts that capture just a fraction of that complexity. “Languages are vehicles of our cultures, collective memory and values,” UNESCO wrote in its Atlas of the World’s Languages in Danger. And yet this important cultural heritage is at risk. 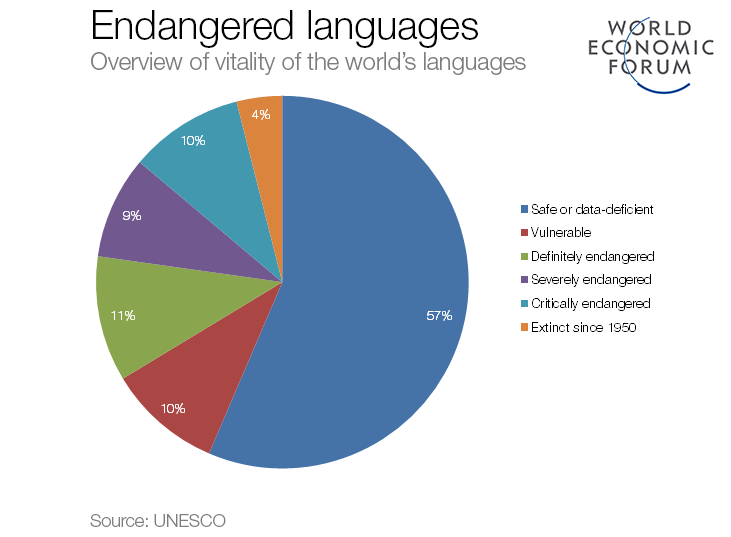 According to the Atlas, almost 3,000 languages around the world are either extinct or under threat of becoming so. 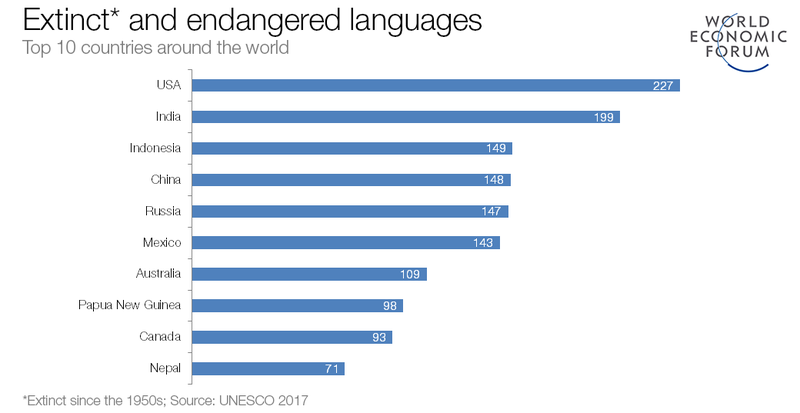 In an attempt to reverse this trend, UNESCO has been mapping extinct and at-risk languages since the start of the millennium. This is what the top 10 looks like (the full database is searchable here). What does it mean to be American, or French or Colombian? Is it about where you’re born? Or where your ancestors came from? Actually, for most people it’s about something else: the language you speak. 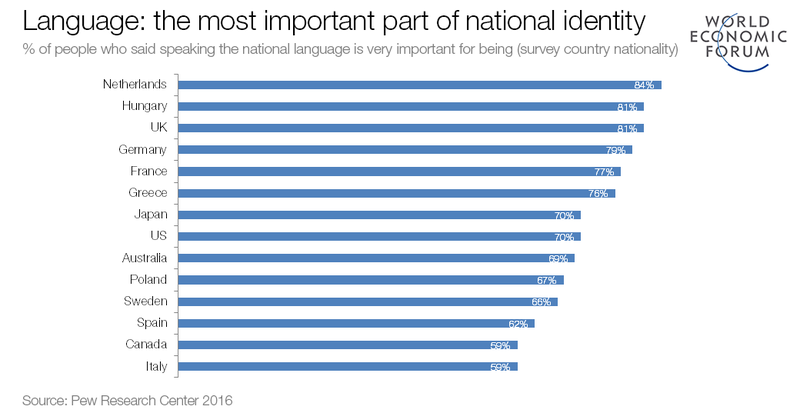 In spring 2016, Pew Research surveyed people from across the world about their attitudes to national identity. With the exception of Hungarians, Greeks and Japanese, the majority of respondents said birthplace did not matter. But in every country, most people were in agreement that to be considered a national, you have to speak the dominant language. Yes, it’s hard work learning a language that’s not your own, but it also opens up a whole world of opportunities. In the US, for example, demand for bilingual candidates more than doubled between 2010 and 2015. Which is probably why billions of people are trying to learn a second language. Of those, around 150 million are using the free language-learning app Duolingo. 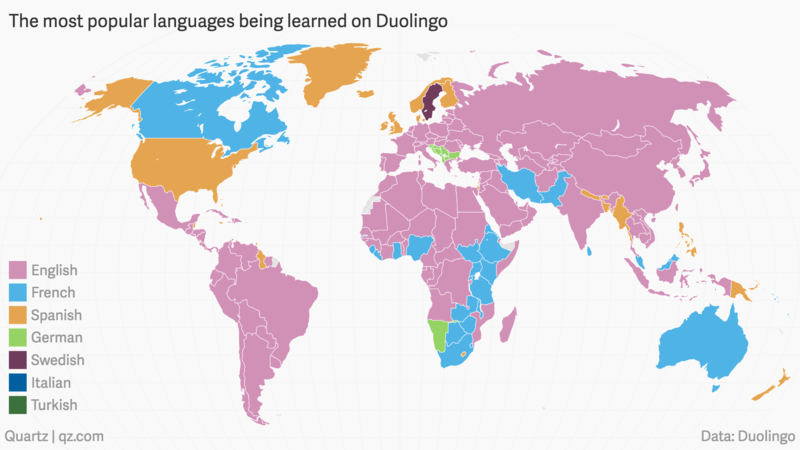 The app only covers 23 languages, but this map provides a snapshot of the most popular. If you thought learning just one foreign language was tough, pity the people of Papua New Guinea, where 839 languages are spoken. That’s nearly three times as many living languages as in the entire European continent. Those were the findings of the latest research from Ethnologue, an organization that catalogues the world’s languages. For a language to be considered “living” it had to have at least one speaker who considered it their mother tongue. 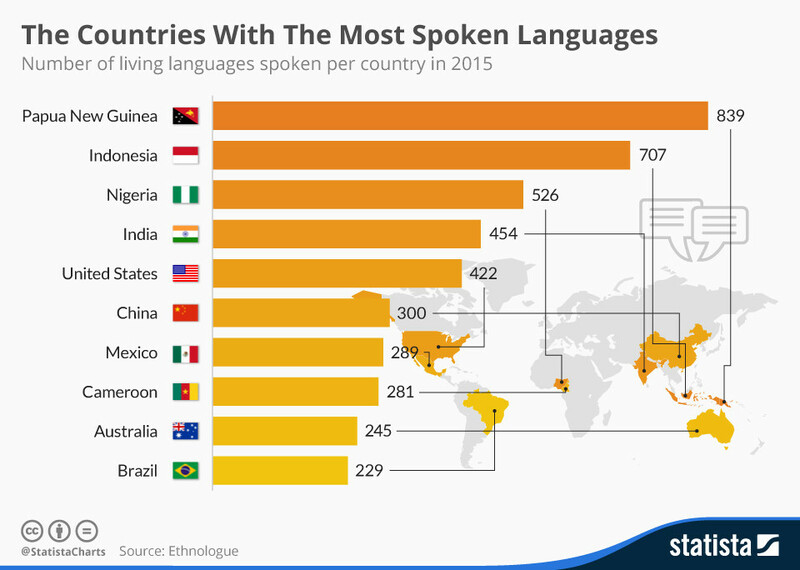 Tiny Papua New Guinea might be home to the most languages, but which is the most powerful? Last year a group of scholars asked themselves that question and their conclusion won’t come as a surprise: English. 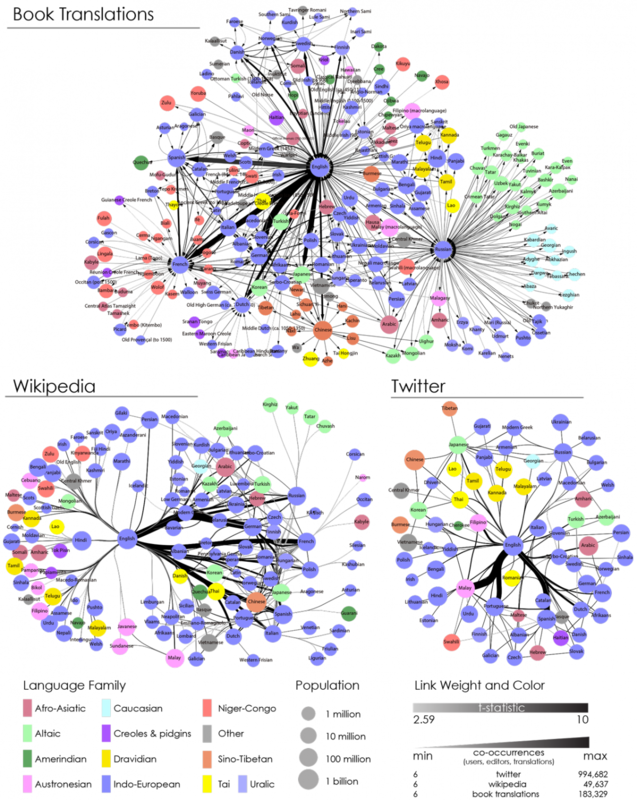 Rather than focusing on the languages themselves, they instead looked at how they were connected, drawing on data from more than 2.2 million book translations, 382 million Wikipedia page edits and 550 million tweets. You can read more on the methodology here. Learning languages: You have the skills, you just need to unlock them.